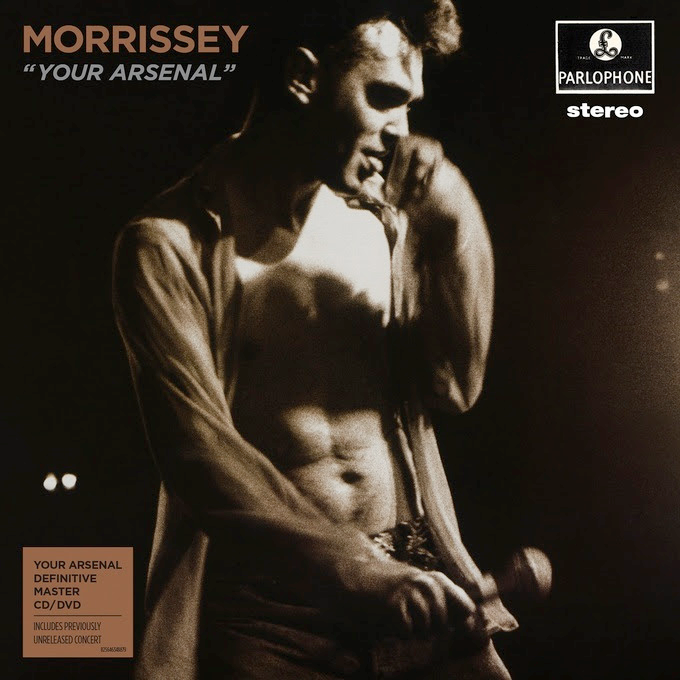 Your Arsenal (Definitive Master Edition) is a special remastered re-release of Morrissey's third studio album from all the way back in nineteen-ninety-two. With this being the first album review by me here on Mondo Coo Cast I am going to be talking about each song one by one. This might not be the case every review as not all albums have setlists where you can talk about each song individually (for various reasons). If you don't like my style of reviewing music... Too bad as there's going to be more album reviews in the very near future. So sit back, relax, the review is right after the jump. (Click "Read More" to read the full article). The opening track of this album is a very nice listen indeed. The song kicks right in with some very intense guitar playing and then goes into an even more intense surf rock styled sound. The drums help compliment the song and adds to the surf rock sound however the beat of the drumming in this song is just the same notes throughout the song but that didn't worry me at all as it worked really well in this case. The vocals on this song is quite strong and relaxing all at the same time and just listening to all the instruments mixed together made for a very strong opening. This song also made me feel powerful like I was an action movie star walking to my car after an explosion (like that one scene from the Mel Gibson movie "Payback (1999)". A great way to open an album. I love the guitar in this song as it has a very monstrous classic rock sound like something by David Bowie or T.Rex. The guitar also becomes quite intense past the half way point and we get a very well done solo. Vocals in this song have a very trippy stoner rock vibe that works very well but unfortunately I wasn't feeling anything from the vocals until half way through the song as it sounded a little too bland for my liking. Drum and bass in this song sounds okay but nothing really too special as it's the same beats throughout the whole song. Overall this was a pretty decent song with a strong second half. The third song is by far the weakest track you will hear on this album. This song to me felt like a filler track slapped onto the album because they were one song short. The main problem with this song is that it just simply drags on for far too long and by the time that the song starts to sound interesting it is far too late and the song is over shortly after. The instruments are a mixture of electronic and acoustic and it does sound nice for the first minute but then you will quickly become sick of it as it is the only thing you hear until the last part of the song. I'm guessing that they were going for a huge build-up but it didn't pay off and came off flat. This was also one of the more generic songs I've heard from this band which is a shame as they are very talented and certainly could've come up with something much better than this. Overall I didn't like this one as it was just boring and really generic sounding. You can gladly skip over this one. Up next we have a song that's far from being a disco song (thank goodness) and instead we get a very standard sounding but very good sounding rock song. The instruments in this song are very nice and they don't just only give you a very powerful feeling that will make you feel very confident in yourself but it will also make you feel very relaxed at the same time. Vocals are pretty strong in this song and really add to the feeling of the instruments. Beat wise this song is decent with a nice mixture of sounds. Overall this was a very decent song with a nice solid sound that will make you feel all warm and fuzzy on the inside. Up next we have a pretty simple yet charming song called "Certain People I Know". All the instruments in this song have a very strong influence from the band "T. Rex" and especially that of one of their songs titled "Ride A White Song (1970)". If you don't know what that sound is then let me explain in a way that you can all understand (uh hopefully). The sound of this song is a soft classic rock sound with a nice and bouncy up-beat tune... or to make it more blunt, hippy music that your parents (or grandparents at this day and age) listen to (damn that sounded more ruder than I had planned). The vocals on this song are pretty simple and there isn't much to them but that is all that is needed for this song. In the end this isn't one of the strongest songs of the album but it is far from being bad and ends up being quite a charming and fun song. The second half of the album kicks off with a very cheeky pop-rock song that gets right to the point and tells us that well... We really do hate it when our friends become successful. This is a song that you can tell what it's going to sound like right from reading the title and still be satisfied with the sound as it will live up to your expectations. The instruments in this song have a very nice up-beat sound that's suited for a more serious song but the vocals are anything but serious and sounds like that good ol' Morrissy is taking the piss out of them. I really liked this song those reasons and it put a huge smile on my face as while it is a silly song it is also very honest and truthful. It is also a very short track adding to the feeling that it's making fun of top twenty pop songs you hear hundreds of times on the radio. Overall this was a very clever and fun song that is sure to put you in a good mood. This song is one of my personal favorites from this album and the only reason why this song worked was for the quirky placement of the word "Fatty". The instruments do sound very nice with some up-beat guitar and relaxing drums but sadly they do sound a little generic. The vocals is the real meat of this song as its so random and weird that it adds a whole load of fun and charm to the song and it also turns a very generic sounding song and turns it into something very unique. It is also very catchy and I can't help but sing this song every time I eat my favorite food and it's even funnier when the food is something fatty (like a donut). A really fun song overall. This song is also another personal favorite of mine from this album. The sound of this song is very beautiful with a nice romantic tune that's very charming and full of emotion. The vocals are very strong and charming with a very warm heartfelt feeling and you can't help but feel warm on the inside yourself. Instruments are repetitive in this song (like most songs on this album) but done so beautifully that you won't even care. The song ends with a very nice jam When I hear this song it makes me feel like grabbing a loved one (mainly a girlfriend, wife, boyfriend, ETC.) and dancing very romantically and feeling like that you are a part of a classic movie... Actually this song feels like it should be in a classic romance flick as a whole. Overall this is a great tune and is the strongest song on this album. Continuing right off from where "Seasick, Yet Still Docked" left off we are greeted with some very beautiful piano mixed in with some distorted radio waves with messages going through. This intro feels like a love couple are reuniting after being separated for far too long. Soon after the main part of the song kicks right in with another strong vocal performance full of emotion with a side of romantic sounding instruments. After that strong performance we are serviced with another lovely sounding jam with the song closing off with some creepy sounding piano. While I did like this song I didn't find it as enjoyable listening to it on it's own (it happens while I have my iPod set on shuffle) and for me the best way to listen to this song is when "Seasick, Yet Still Docked" is joined up with it. This way you get the full enjoyment of having a classic romance film in the form of two five minute (give or take) songs (or a ten minute song in the form of two acts) and if you do that you'll have a masterpiece playing in your ears. We are up to the final song of the album and boy is it a great way to close off the album. The instruments on this song have a very smooth inde rock sound that gets you very excited. The variety in sound isn't much tune wise but they still make some pretty interesting noises nonetheless. There is also a very basic but very nice sounding guitar solo that will make you grab your old lighter and light it up and wave it around (just be careful not to do it under a fire alarm). Vocally this song is pretty good although the lyrics are pretty basic but simplicity works. This mix of the song was not on the original release of this album but instead it was taken from a US master instead (I'm guessing because it sounded better). I like the feeling I get from this song as it's a feeling where it feels like that this album is telling me "Don't worry kid, there's always tomorrow where we'll meet again" which gives me another reason to replay this album again and again. Overall this was a really good song and a great way to finish this album. Overall this is a really great album with a whole bunch of songs that sound like pure gold. You'll also like the quality of this remaster as it sounds crystal clear. This album also comes with a bonus DVD filled with live footage but unfortunately I wasn't able to review that (due to not being included in the review copy). I highly recommend you check out this album and you will not regret listening to it once you get a hold of it. Great listening.